Dr. Johnson debunks the hype surrounding the persecution of O. J. Simpson with such clarity that it is frightening. His conclusions demonstrate how the "American Dream" gets sabotaged, when the protection we take for granted as citizens are annihilated, while sanctioned by a racially distorted media. 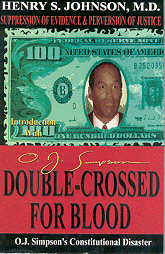 This book is not just about O. J., it is about the rights of all Americans, whose rights can be trampled and unprotected, whether they be Black, White, rich, poor, man or woman. You the reader and every American should have the opportunity to have available unvarnished truth about the "Trial of the Century." Copyright © 2003-2016 Professional Publishing House. All Rights Reserved. No Content May Be Used Without Expressed Written Permission. Site Updated & Maintained by Areli Web Design.